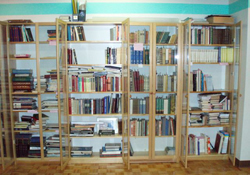 The Library books and videos in Ukrainian and English languages are available. The library holds a large collection of subjects ranging from history to literature and art. The collection includes videos documenting events leading up to Ukrainian independence in 1991 and local productions on Ukrainian themes. The library is open to the public, Saturdays from 11am to 2pm, and is located on the mezzanine level of The Ukrainian Centre. For information about helping in the Library, contact Theresa through The Ukrainian Centre at 604-274-4119 or by e-mail.